Fall is here, but festival season is still going strong. We cannot wait to return to Union Market and dance the weekend away at the highly-anticipated All Things Go Fall Classic 2018. Stay tuned to Capitol Sound DC on Instagram and Twitter on Saturday and Sunday, as we report live from from the festival all weekend long. In the meantime, here are the elements of the festival we are most excited for, and things we hope you’ll enjoy with us on-site or following along on social media. If you want to compose a strong female line-up, Charlene Kaye absolutely fits the bill. Kaye isn’t afraid to write about and share her personal experiences – challenges and triumphs – of not only being a woman, but also of being woman in the music industry. Songwriting is an avenue for Kaye to be a voice for women, as exhibited in one of her recent singles “Cheshire Kitten,” which “celebrates the fact that we (women) are versatile creatures…who can be technically capable and sexual, aggressive and soft, breadwinners and maternal figures.” Kaye has been busy working on her latest album and announced that she will be playing unreleased tracks this weekend. You won’t want to miss out on being the first to hear her brand new songs that are filled with empowering messages. If you’ve ever scrolled through her Instagram page, seen a performance when she was one half of MS MR or seen a music video, then you’re aware of the bright ball of energy that is Lizzy Plapinger. This Saturday, Plapinger is making her festival debut as LPX and we could not be more excited to witness it. Her latest single, “Might Not Make It Home” is the perfect introduction to LPX for those unfamiliar. The song is a cinematic ode to the nights fueled by shots of whiskey and the extra drink you order because you’re not ready to let the night end. For a taste of what’s to come on Saturday, check out the song’s video. *Plapinger co-curated Saturday’s all-female lineup and is the co-founder of Neon Gold Records. She will be speaking on a panel this Friday as part of the Classic Conversations portion of the festival, which is free when you RSVP. Ravyn Lenae makes music that feels like the soundtrack to a dream, and we cannot wait to hear her vocals floating through the air on Saturday night. Neo-soul songstress Ravyn Lenae Washington has a profoundly unique vocal style that will stand out in all of the right ways amidst the female-forward Saturday line up. Best known for her track “Sticky,” this 19-year-old from Chicago sings soul well beyond her years and wears her influences on her sleeve. Washington recently collaborated with Steve Lacy on tracks like “Computer Luv,” and promises to dominate the new era of the soul genre. Photo courtesy of Maggie Rogers. Maryland-native, Maggie Rogers’ life has been a whirlwind in the two years since a video of an awestruck Pharrell hearing “Alaska,” a song she had written for class at NYU, for the first time went viral. The singer and songwriter, who has a knack for writing cathartic pop songs, has proved she is more than just a flash in the pan. Rogers has strategically released music at her own pace and has found a way to maintain a close relationship with her fans without overexposing herself. On Saturday, she will headline the All Things Go Fall Classic which she helped curate. Her most recent single, “Give A Little” reflects upon the wild ride she’s been on the past couple of years and we can’t wait to dance with her on Saturday night. *Rogers will also be speaking on a panel this Friday as part of the Classic Conversations portion of the festival, which is free when you RSVP. We had the pleasure of interviewing Katie Henderson, McKenna Petty, Alisa Ramirez and Cristal Ramirez back in February and are incredibly excited to have them back in DC on Sunday. In the several months following our interview, the four best friends from Utah have been grinding nonstop. They released their debut album, “When My Heart Felt Volcanic,” had their first performance on late night TV, performed at Lollapalooza and Firefly, and most recently, secured a slot opening for 5 Seconds of Summer. If you’re not acquainted with The Aces yet, start with “Stuck” and “Volcanic Love”—you’ll be hooked. You can catch us screaming the choruses to “Just Like That” and “Last One” on Sunday afternoon. Cautious Clay is an introspective songwriter and producer who creates indie experimental pieces that blend soul, hip-hop, and electronic pop. Cautious Clay is an alumnus of George Washington University in DC where he studied Jazz. After graduating, he worked as a producer in New York City for a short time before deciding to devote all of his time to writing and producing his own music. Clay’s efforts resulted in his debut album “Blood Type,” which dropped in February. The album’s narrative reflects on Clay’s identity and how it has been shaped by how he spends his time and who he spends his time with. In August, the up-and-comer released a new EP, “Resonance,” which focuses on the trials and tribulations of being an independent artist. We can expect Cautious Clay to play songs from both records as well as bouncy remixes that are meant to be experienced live. Photo courtesy of Betty Who. Betty Who returns the All Things Go Fall Classic 2018 after a memorable set on the Union Market stage last year, and we cannot wait to see what is in store for their performance on Sunday evening. Jessica Anne Newham, better known as Betty Who, and her band bring international pop star energy to even the smallest of stages, blowing out uplifting ballads and abundantly sweet bangers with a full band, dancers and impressive choreography. After an exciting year of remixing the Queer Eye theme song and traveling the world while on tour, Betty Who is sure to warm up the stage for Misterwives and headliner Carly Rae Jepsen. We were so excited to hear that MisterWives had been added to the All Things Go Fall Classic lineup and cannot wait to see them on Sunday night. The band was on the road in the spring for their headlining “Let the Light In” Tour, and went on to support Thirty Seconds to Mars for the summer alongside Walk the Moon and Joywave. We’re lucky that the crew is taking time from their well-deserved break from tour to perform as a special guest at this weekend’s festival. MisterWives is known for their pump-it-up pop music, which is only amplified by their onstage presence. You definitely won’t want to miss their peppy, colorful performance this Sunday. Photo courtesy of All Things Go. Beyond the killer music, another element of this festival’s experience that makes All Things Go truly unique is the incredibly stacked food lineup. Housed at one of D.C.’s culinary havens, Union Market will showcase some of their most delicious vendors to fuel our weekend-long dance party. From Buredo’s sushi burritos, Pinstripe’s classic barbecue, Timber Pizza Co’s gorgeous pies, Vice Cream’s simply delicious ice cream to cool us down, and the pure perfection of everything Shake Shack produces, there’s no way anyone should go hungry this weekend. Neglecting to take advantage of the wildly delicious food on-site at All Things Go would be a truly tragic mistake. This year, All Things Go partnered with The Women’s March to curate an all-female line up on Saturday and facilitate a “Classic Conversations” kick-off event on Friday night. 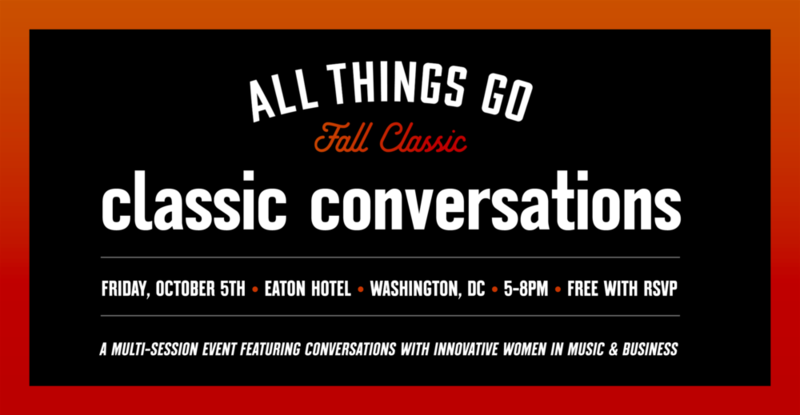 This event will feature innovative women in the music industry who are moving and shaking music’s male-dominated status quo. Panelists include Fall Classic artists Maggie Rogers and Lizzy Plapinger (who curated the festival’s Saturday all-female lineup), Women’s March co-president Tamika D. Mallory, Maydan/Compass Rose owner Rose Previte and more.